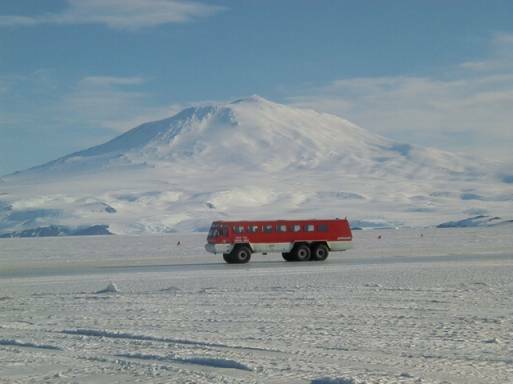 For most of us in Antarctica a ride on the Terra bus signifies the beginning or end of a season on the Ice. For me it indicates that a flight will soon be leaving for Christchurch, NZ, the South Pole, or one of the deep field camps. 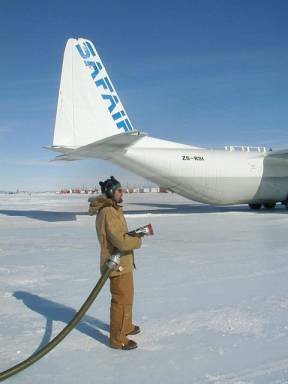 Just before the passengers board the plane my crew fills its fuel tanks for the journey. McMurdo is the hub for all air traffic in Antarctica. Over the course of the season we are required to move our airport 3 times. 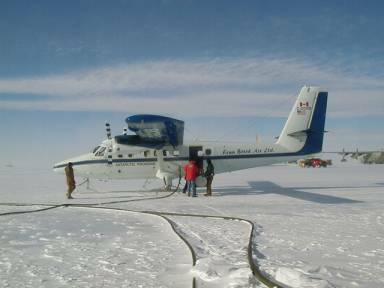 During the early part of the season we utilize the frozen ocean in front of the station to land planes. Ideally we would like to use this area throughout the year as our permanent landing zone. Two key factors make this the most desirable location. First it is the closest to town, only 3 miles away and second it can accommodate wheeled aircraft. With at least 6 feet of solid ice our Ice Runway can accommodate any type of aircraft. During October and November we concentrate on heavy lift wheeled aircraft including the Air Force C5, C141, C17 (aircraft photos) along with the Royal New Zealand Air Force C130 and this white South African Air Force stretch C130. With this fleet we are able to transport larger loads of cargo and passengers. Unfortunately as the season progresses and the temperatures rise the runway begins to melt and eventually floats away. In late December well before this happens we relocate our entire air facility in less than 24 hours to Willy Field. Many days of preparation are required for this and the collaborated efforts of many departments. Come Monday my office has moved and my commute to work has been increased to 7 miles. Willy Field is located on the permanent ice shelf. This is the portion of the Ross Sea that does not melt away each season. Additionally it is over 300 feet thick and covered with snow. Unfortunately this second feature is a giant limiting factor for air support. Wheeled airplanes are unable to land here as they would sink in the snow. To overcome this obstacle the New York Air National Guard has adapted their Hercules C130s with retractable skis. 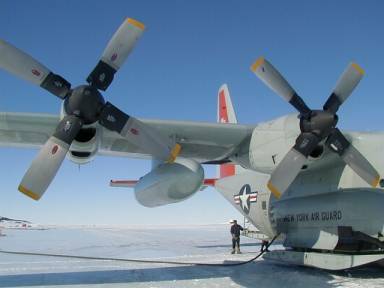 Similar to a sea planes pontoons the skis enable the Hercs to float on the surface of the snow. However with this additional weight and the snows resistance, cargo capacity has to be reduced. Regardless of the location my job continues at a steady pace refueling the fleet of 6 Hercs and 3 Twin Otters. Our runways are like no other at home. We have to overcome extreme environmental conditions and complex logistical challenges. 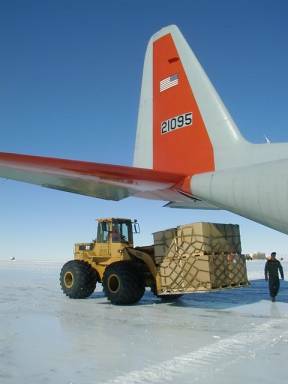 Vehicles have been designed to travel over snow and ice while remote sites require a link to the resources of McMurdo. Our department provides all the fuel needs for the air support operations. At Willy we accomplish this in two ways. Above our fuel truck Delta Scharen is refueling a bulldozer that is hauling reels of flexible hose. 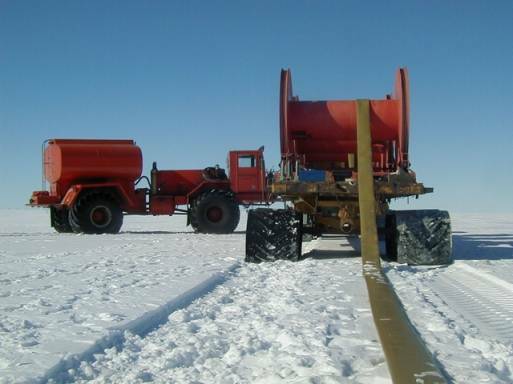 We link these to form a 7-mile connection from our storage tanks in McMurdo to the holding tanks at the runway. From these we can refuel the aircraft directly and Scharens 2,000-gallon tank, which will keep all the airport buildings tanks, filled. Hercs and Otters are not our only consumers on the runway. The Fleet Operations Department takes on the endless challenge of creating and maintaining the 3 landing strips. 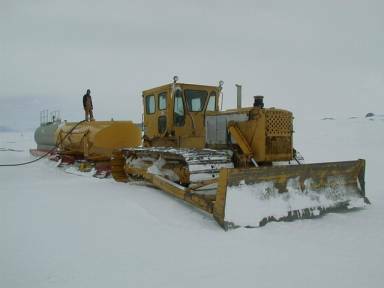 At times their machinery has to operate 24 hours a day jut to keep up with the drifting snow. It is also with their help that our fuel will make its final journey. With the stretch D8 dozer above Fleet Ops will tow up to 3, of our 10,000-gallon fuel sleds to our third runway. The D8 takes about two and a half hours to travel the ten miles to Pegasus our Blue Ice Runway. Aided by the Katabatic winds from the Polar Plato the permanent sea ice is exposed from the blanket of snow that covers Willy Field and the rest of the Ice Shelf. 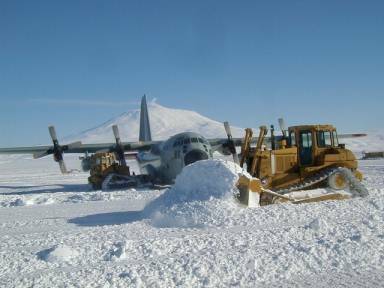 As with the Ice Runway near McMurdo Pegasus provides the hard surface required by wheeled aircraft. This runway in the past has been primarily used only during August and February. The ice surface cannot compete with the summer sun and does melt. However unlike the ice runway it will not float away. The sun may be rule on the surface but is no match for the remaining 300 feet of ice below. 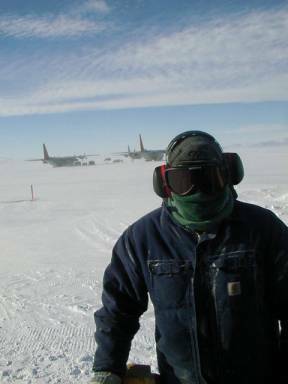 Supporting air traffic in Antarctica is vital for the operation of the program and consumes a majority of our time. We are challenged by the environment to accomplish our jobs but also take advantage of it to enrich our lives.